There are many things wonderful about Albuquerque, from its central New Mexico location to its fine restaurants, museums and outdoor activities. As a landscape photographer, I’d say that I most enjoy the myriad stunning vistas that are in or within an hour or two of Albuquerque’s center. Since one of my photographic goals this year is to expand my panorama skills, what better place to test out new techniques than the southwest? I visited one of these sites last week, the incredible Kasha-Katuwe Tent Rocks National Monument, about an hour northwest of Albuquerque. Kasha-Katuwe means ‘white cliffs,’ which is immediately noticeable as you enter the Monument from the parking area (please click on photos to enlarge). The hike is along a very sandy and dusty trail and before every shot sequence I had to brush my lens off with a lens brush. Even so I found dust on my sensor on many images. Still, the hike was so incredible (and the weather so miserable the first day), I came back a second day. The 1.5 mile trail starts at an elevation of 5,570 feet and ends at the summit at 6,760 feet. But what you will traverse during that time- and I use the word time advisedly- will elicit oohs and aahs at every twist and turn in the trail. As you hike, you go back in geologic time, some 6-7 million years. The hoodoos you see throughout the hike were formed by the blast from a super-volcano that left deposits over 1,000 feet thick. Due to differences in the composition of the deposits, the soils have eroded differentially, leaving tall, inverted cones (hoodoos). Hoodoos that have rock caps on top are protected from erosion, while those without the caps are in various states of decay, creating the sandy footing throughout the monument. The hike wasn’t easy for me. I decided to bring my Arca Swiss 4x5 large format view camera with me. But to use that heavy monstrosity, I needed my 35mm Nikon D700 to act as a spot meter, telling me how to expose the Velvia 50 film I use. So I was slogging uphill through sand that was sometimes ankle deep, carrying a 25-pound backpack and a 10-pound tripod with view camera mounted on it slung over my shoulder. Ouch!! if I keep up working with my 4x5 I’ll invest in a small light meter, for sure. The trail winds through a marvelous slot canyon, with some passages so narrow only one person at a time can squeeze through. This next image I took just at the beginning of the canyon. I was struck by the magnificent Ponderosa Pine roots set against the sheer rock walls and the distant trees. As I set up to shoot, it occurred to me that those roots were exposed over the years by torrential rainwater surging down the canyon. Eventually the root tissue becomes barked over for protection. This panorama shot doesn’t come close to its awesome size and commanding presence. 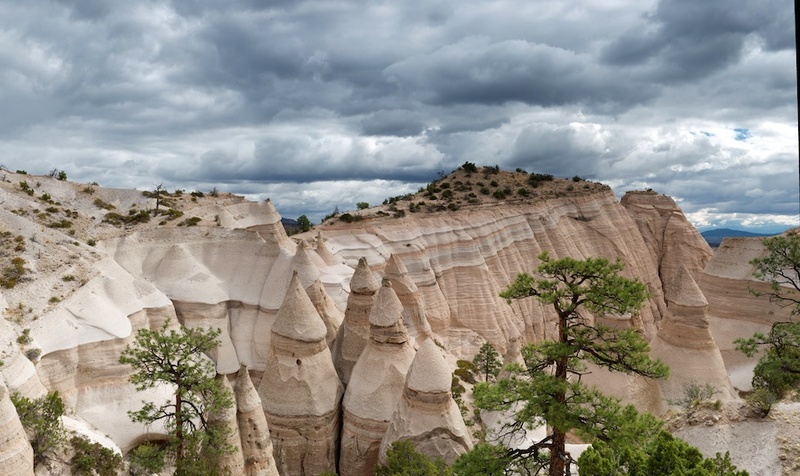 If you visit Albuquerque, and after you read this series of blogs you may well decide to do so, plan on a trip to Kasha-Katuwe Tent Rocks National Monument. You’ll not be disappointed. Remember to bring lots of water if you plan to hike to the top of the trail. Also, be sure to wear solid hiking shoes that cover your ankle; anything less and you’ll be dumping gritty sand from your shoes every few minutes. Because of the dust, I recommend that you keep your camera either in your backpack or in a protective bag and pull it out only as needed. As with any hike in New Mexico, wear plenty of sunscreen, wear a hat (and long sleeves and pants if you are sun sensitive), sunglasses and watch out for snakes. The latter warning is only generic, as Tent Rocks has enough human presence that snakes avoid the area… but watch out for snakes!